Last fall-winter season, I purchased three new coats, which felt rather indulgent. Nonetheless, each proved to be fantastic, from a cost-per-wear perspective. I originally had some doubts about how useful the Everlane cotton trench coat (my review here) would be, as autumn and spring are traditionally very brief in NYC. As it turns out, we've had unseasonably warm fall-winter seasons for two years now, which allows for several weeks of trench coat weather. 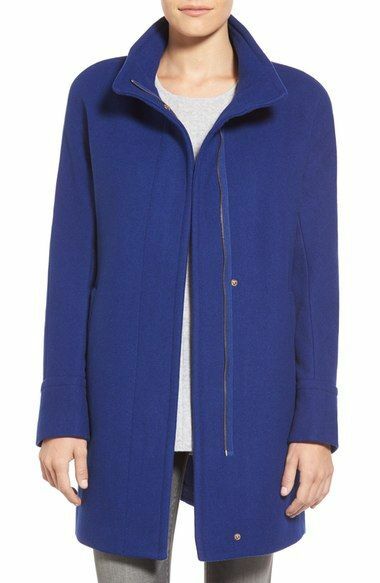 The Elie Tahari down coat (old, this year's version, but it's definitely not worth that ludicrous full price!) was my go-to coat once true winter set in. That bright orange Ellen Tracy cocoon coat (exact color no longer available) was purchased on a whim, at the tail end of the post-Christmas sale season, but it's been very useful these past few weeks, once temperatures started dipping below 50 degrees Fahrenheit. I certainly don't need another coat. In addition to those three, I have another wool-cashmere blend single-breasted Calvin Klein reefer coat (similar Lauren Ralph Lauren, similar Kristen Blake, similar but very pricey Fleurette), which covers the temperatures in between cocoon coat weather and down coat weather. Still, my workplace wardrobe is so dominated by somber black clothing that brightly colored coats become very tempting as one of relatively few ways to add some interest and variety to my winter-time work outfits. As early as September, I was wondering if I might add a bright cobalt blue or hunter green coat to my wardrobe this season. 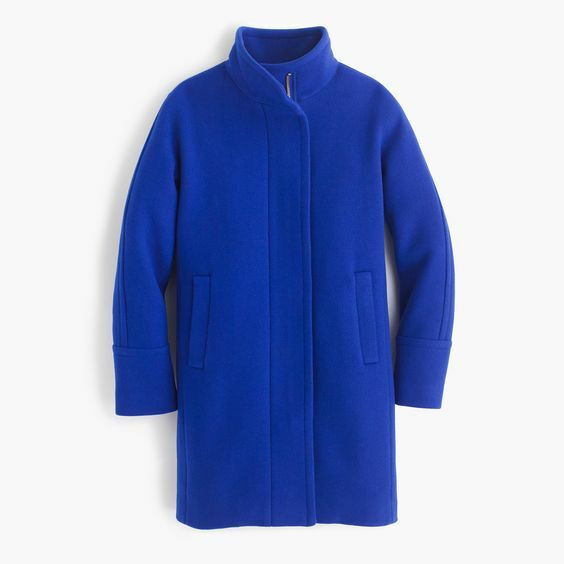 If I end up deciding to indulge this impulse, the candidates are the J.Crew Stadium Cloth Cocoon Coat pictured above ($245 with the 30% off code "FESTIVE" until the end of today) or the Ellen Tracy Wool Blend Stadium Coat I bought last year (currently $198, but I'd absolutely wait for a sale, I like both the "Kelly Green" and "Cobalt" shades pictured below). I was at a brick and mortar J.Crew store this weekend to make a return, and was able to try on their Cocoon Coat. I found that a size 4 regular at J.Crew fit essentially the same as my size 6 petite in the Ellen Tracy (seen on me here). As for which one is actually "worth it," if any? At today's $245 sale price, I'd take the J.Crew version over the Ellen Tracy coat's nearly $200 full price. But, when the Ellen Tracy at sale price is likely to end up at half the price of the J.Crew one on sale? Then I'm not so sure. The only certain conclusion is that I'm probably not ready to actually purchase a new coat right now. The Ellen Tracy coat is noticeably lower quality, with a slightly thinner fabric that can be a bit scratchy, though I only notice it at the spot where the collar meets my chin when it's zipped completely up. There's also a tiny gold decal, on the left pocket, that can look a little cheap. I'm going into my second year of moderate wear with this, but it isn't actually showing much wear and tear at all, just a tiny pill in one random spot, near one shoulder, which I picked off. I wouldn't be too surprised to see another small pill or two in the coming year, and while it's no big deal, it's not something I've ever experienced with my old Calvin Klein coat, which is going into its third year of heavier wear. Common wisdom has it that the J.Crew coat, like most J.Crew items, is likely overpriced for its quality, and I don't doubt that. The wool blend material feels nicer, but only barely, and it doesn't feel special or luxurious to the touch. The lining also feel smoother and better than the lining on the Ellen Tracy coat, for what that's worth. How many coats do you own? 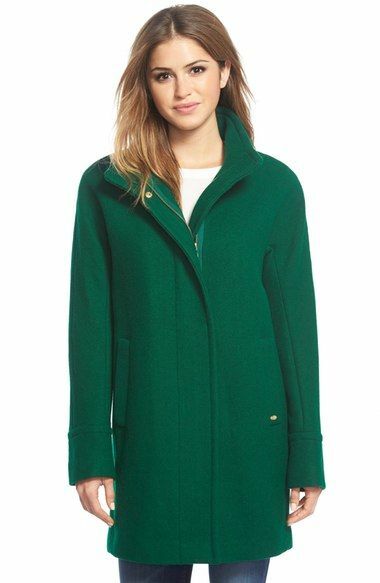 Do you own any J.Crew coats, and have they proven to be a good value? While I think they're nicer (and certainly have prettier designs and colors) than a lot of the more moderately-priced wool-blend coats at, say, Nordstrom (in the Kenneth Cole, Tahari, and well, Ellen Tracy range) that often end up around the $140 price point on sale, I've not familiar with whether the J.Crew coat prices drop much lower than $220ish. Comparing those prices, it doesn't seem like the J.Crew coats are generally worth it, but I may be wrong!